The 6th Annual Halloweensie Contest 3 Word Challenge! AN EXTRA SPECIAL 3 WORD CHALLENGE: A HALLOWEENSIE CONTEST ENTRY! What is the Halloweensie Contest you might ask? Well, author Susanna Leonard Hill hosts an annual contest for very short Halloween stories, using 3 specific words: THE HALLOWEENSIE! Right up my alley, #amiright? For specifics, and to enter your own amazing 100 word (or less) children's Halloween story/poem, go here! Her 3 selected words are GHOST, SPIDER and MOON. wanted to see who could frighten the most. One point to Spider for that BOO! in the tree. One scare for Ghost, for that ghost wannabe. Two more to Ghost for those giggling boys. One more for Spider – that one she enjoyed! that filled those tricksters with woe and with dread. those Halloween jokers won’t be back soon. but who scares YOU most on All Hallows’ Eve? They say you shouldn't judge a book by its cover, but...I mean, come on! LOOK at these covers! Don't you want to read them, too? While this one has been available outside of the US since 2016, it won't be available in the States until March 7, 2017. 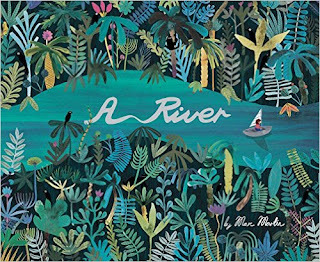 Named one of the best children's books of 2016 by The Telegraph, A River tells of the "imaginary journey of a child inspired by the view outside her bedroom window." Ben Newman, the illustrator behind this year's Professor Astro Cat's Atomic Adventure and 2013's Professor Astro Cat's Frontiers of Space, will be releasing his first solo picture book, Boo! about a brave little mouse who thinks he is the bravest animal around. 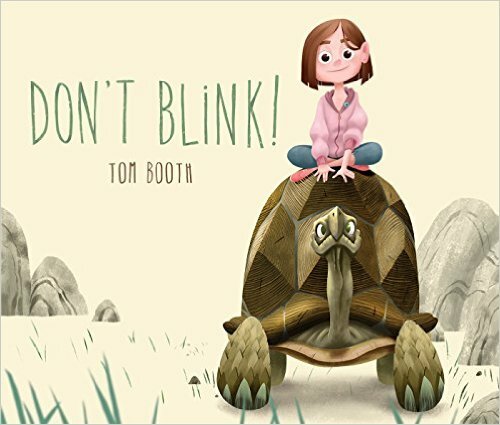 Although Tom Booth isn't a newcomer to children's lit - he is the illustrator of Derek Jeter Presents Night at the Stadium - this is the first book he has both authored and illustrated. From Macmillan: "Think you can win a staring contest against an elephant? What about a gorilla, a cheetah, a fox, or an alligator? What about all of them - AND a bunch of their other animal friends - at the same time? You're about to find out! Whatever you do DON'T BLINK! Dashka Slater is the author of several books for children, including the Junior Library Guild Selection The Sea Serpent and Me as well as Dangerously Ever After. 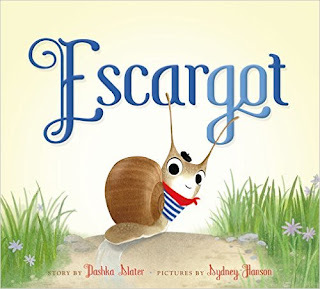 Escargot tells the tale of a snail who wants only to be your favorite animal, and to make it to the salad at the end of the book. You can read all about Escargot (and his salad) in April 2017. Nicholas John Frith is the author-illustrator of this year's popular Hector and Hummingbird, his debut picture book, which published to starred reviews from both Kirkus Reviews and Publisher's Weekly. Hello, Mr. Dodo features Martha, a bird loving girl who might have just discovered a dodo. But what will happen when the rest of the town learns about her discovery? 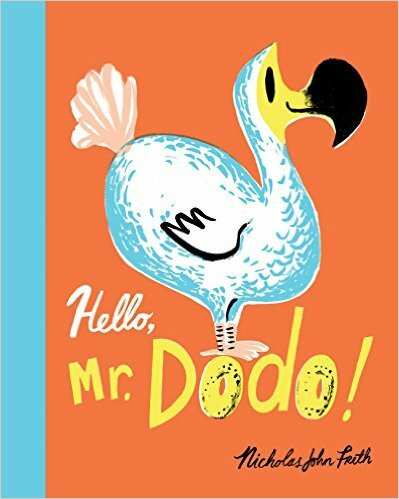 Will she have to say goodbye to Mr. Dodo? Fortunately, we don't have to wait too much longer to find out...just until January! 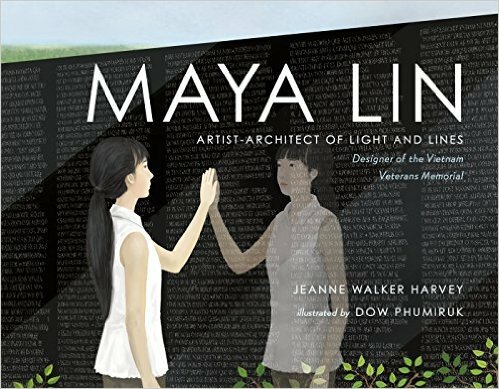 Jeanne Walker Harvey is the author of several children's books, including My Hands Sing the Blues: Romare Bearden's Childhood Journey and Astro, The Stellar Sea Lion. This will be Dow Phumiruk's first traditionally published picture book, and the art looks BEAUTIFUL. But we'll have to wait until May to see more than just snippets! Good thing there are still loads of wonderful books out there to help us wait until these beauties come out! Are there any forthcoming books you are doing an impatient-happy dance for? Let me know in the comments! Happy reading! but some are too fluorescent. I don’t get all the hype. I think they’re kind of sour. of a ladybug like me. …but they’re not so fond of me. Halloween is coming! Are you ready? Need a little inspiration? 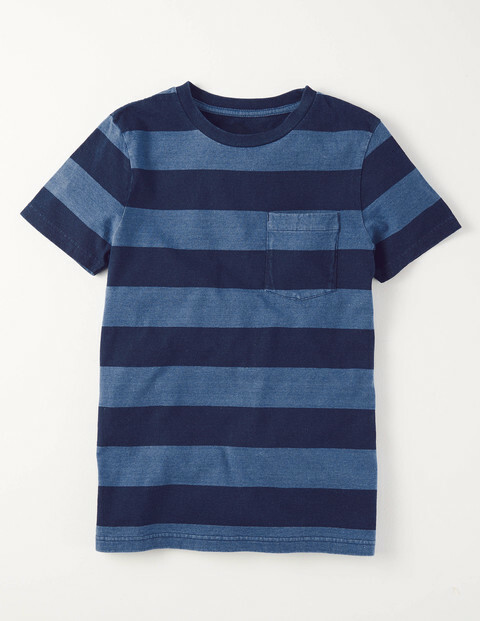 I've put together eleven kiddo costume ideas (with a couple of bonus coordinating parent costumes!) based on some of our favorite picture book characters. None of these require crafting (in case you were worried), just access to Amazon! :) If you have a little bookworm at home, one of these costumes might just be perfect for you! And, if you live in Texas, don't forget about the kid's book character costume contest at the Texas Book Festival, which is the weekend AFTER Halloween. And goodness! Who knew overalls appeared in so many picture books? I'd love to hear if your littles (or you!) 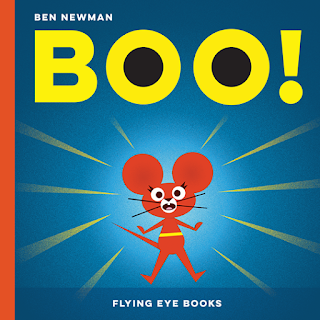 plan on going trick-or-treating as a book character! Drop me a note! Ohh, and BONUS! I just discovered these little gems: book themed pajamas! They have some great ones: Uni the Unicorn, Dragons Love Tacos, Mr. Tiger Goes Wild, Mousetronaut, Goodnight, Goodnight Construction Site, Duck and Goose, and more! Go check them out! If you've ordered from them I'd love to hear all about it! Leave me a comment! I am SO excited to welcome an AMAZING group of authors and bloggers today to Pickle Corn Jam as we all discuss our favorite children's books of 2016! 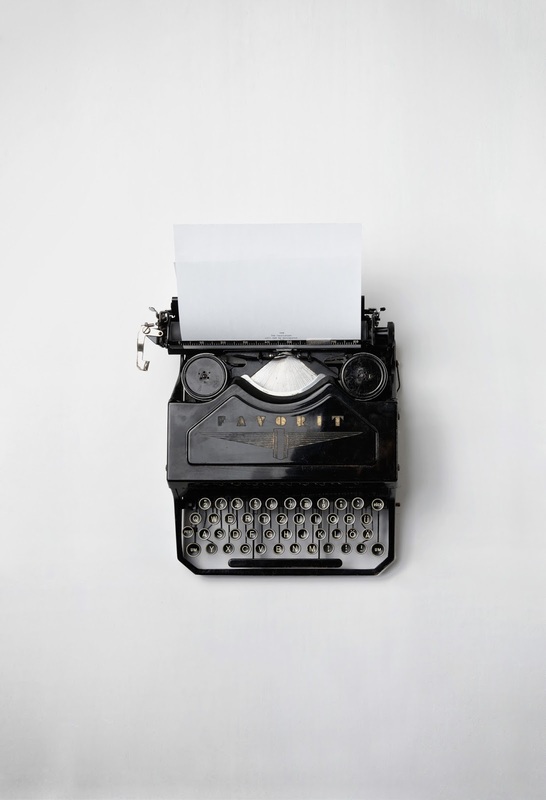 Each of us have written about one book; simply follow the links included at the bottom of each of our posts to see the remaining recommended list! Who is playing along? Cate Berry, Charnaie Gordon, Danna Smith, Eileen Manes, Henry L. Herz, Karen Santhanam, Kell Andrews, Keyosha Atwater, Liz Garton Scanlon and Vanessa Roeder! You can find more about who we are at the bottom of this post. But be sure to click through all the links to see our top 10 picks for the year so far! 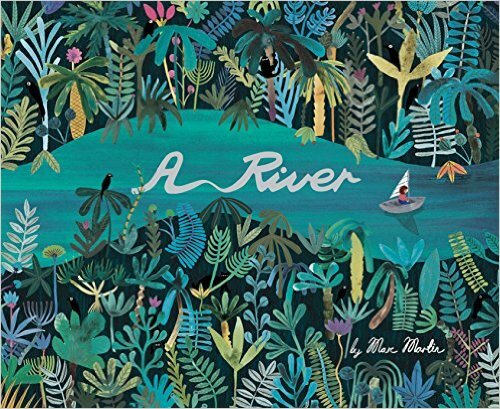 Without further ado, I present my pick for Favorite Children's Book of 2016! That sure does look fun, right? A book set on another planet, with tadpole-like aliens (Tadpoliens? I'll go with it.) and made up words? Yes, please. But...I do know better than to judge a book by its cover. So I read it and giggled (and what's better than a middle-aged woman, standing alone in the kid's section of a bookstore, giggling to herself, I ask you?). Then I bought it, read it to the kiddo and giggled some more. We read it together about 672 more times, giggled a bunch, and added it to our 2016 faves list. Best frints "Yelfred and Omek have been best frints since they were little blobbies." 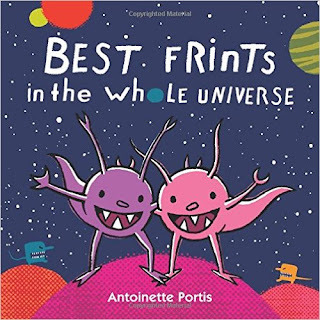 They live on planet Boborp, use their teef, eat yunch and play with spossips. Much in the same way that kids are able to "magically" tell you the next line of text in a book with a repetitious structure, kids will automatically understand that frints are friends and blobbies are babies, who eat lunch with their teeth and play with spaceships. But now, they'll also feel like they've been let in on a secret - like they are little secret agents who suddenly understand the language of ALIENS. Emember-ray ow-hay eat-gray ig-pay atin-lay as-way? When Omek takes Yelfred's spossip for a spin, even though Yelfred said no, and accidentally shmackles it, Omek and Yelfred need to find a way to fix more than just the spossip. They also have to fix their frintship. By hiding a message (sharing, working together to fix a problem, regrowing friendships) within fun language, kids can decode and understand the message without feeling like they are reading a message-y book. If I have to have a complaint, it is that there is a teeny, tiny lack of consistency in the alien "language." Yelfred and Omek "flixed" the spossip after it was broken, but when Omek comes up with the idea, he says they can FIX it rather than FLIX it. But perhaps it only becomes "flix" in the past tense because the Boborpian language of Tadpoliens is difficult and tricky..."not like here on planet Earth." Our favorite books of 2016 list is a pretty amazing list, filled with beautiful, thought provoking books, about nature and life and following your dreams. 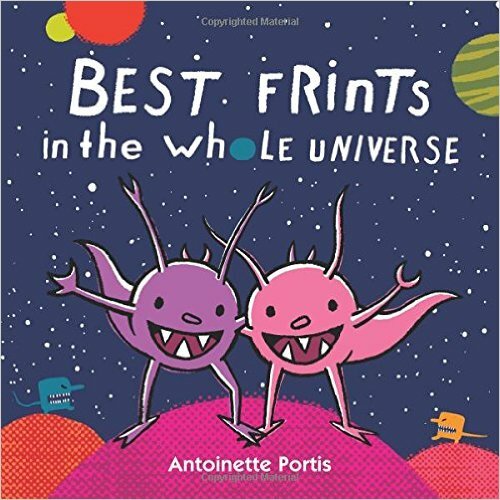 Best Frints in the Whole Universe isn't the prettiest book of 2016. It's not the deepest book of 2016. It isn't even about following your dreams (though Omek does get to take the spossip for a spin). But it is fun. And it is unique. And it has a whole lot of heart (and games of "eye ball in the peedle pit"). And sometimes, that is just what I want for my kiddo (well, maybe not games of eye ball).